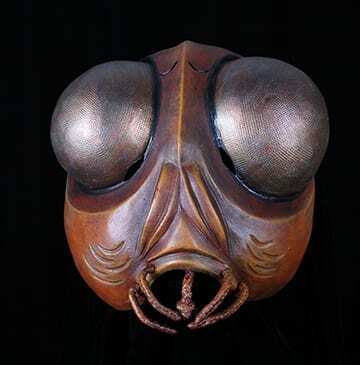 This theatre mask was created as an add on to the insect and animal masks for children’s theatre. The fly was commissioned by Brendan Murphy at Bay Shore High School. It is a lovely addition to the insect collection and is slightly more realistic in form than many of the others. The mask is made out of neoprene, is very durable and is painted with a variety of metallic paints to reflect the head of bottle fly in summer. As with all of the masks it is held to the head with a polypropylene strap with an adjustable cam buckle. I don’t know why I swallowed a fly. I suppose the next mask to make would be a horse of course.